Time for the third cocktail night! This time around we’ll be mixing up rum drinks, most of them on the lighter side. Yes, I know it’s November, but down here in Georgia, the weather’s still in the 60s or lower 70s, and who doesn’t love one last taste of summer? Shake with ice and strain into a cocktail glass or coupe. If you’re feeling elegant, leave un-garnished. 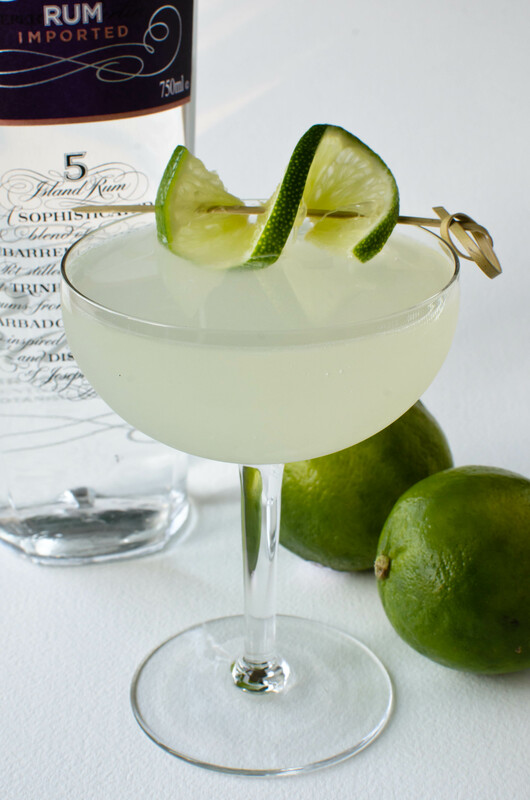 If, after that first sip, you think you’d like it to be more tart, garnish with a lime wedge. Simply wonderful. Since I’m feeling a bit lazy, I’ll condense the history of the drink into a recommendation instead: check out Matt Robold’s (aka Rumdood) Daiquiri post for all the info you really need to know, oh, and be sure to see his follow-up on the Hemingway Daiquiri (which, it turns out, is not a Papa Doble). Now, some people like their Daiquiris to be more sour than sweet — I prefer to increase the sugar on mine, but others only call for a teaspoon of sugar to match either a half-ounce to an ounce of lime juice. Of course, if you’re Robert Hess, you always make things sweeter, and if you’re Jason Wilson, you debate about which rum to use (he likes a white rhum agricole, but I prefer less vegetal whites — Jamaican or former British islands). For some information on its relatives and variations, and additional commentary on rums, check out Paul Clarke’s article on Serious Eats. As Clarke says, gold rums will likely work in the Daiquiri, but substantial tweaking will be needed for dark rums, which have a richness of their own that you may not want to spoil. 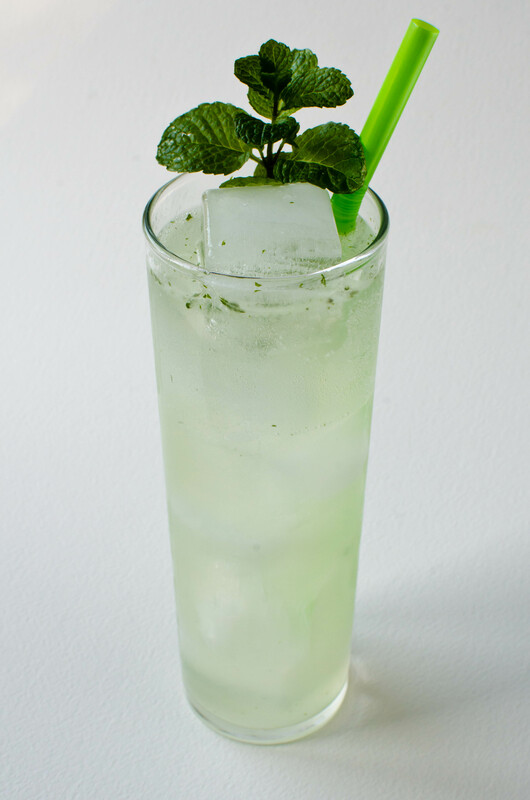 Muddle the mint leaves and simple syrup in a cocktail shaker, then add the rum and lime juice. Shake with ice and (fine) strain into an ice-filled Collins glass or double rocks glass. Top with the soda water and give it a gentle stir. Garnish with a mint sprig and serve with a straw. What I find interesting with the Mojito is that it really doesn’t differ from the Daiquiri that much, but the simple addition of the mint changes the drink dramatically. What is also impressive is the mindbogglingly diverse methods that people use to prepare a Mojito. The above version is adapted from Jim Meehan’s recipe from PDT — they use Banks 5-Island rum, according to their cocktail book — and it is one of the simplest methods out there, but more complex and finicky methods abound. Murray Stenson, from the Zig Zag Café in Seattle, has a layered, built method documented at Married With Dinner. Jeffrey Morgenthaler has a few words to say on the subject, as well, and provides his go-to recipe, which is more of a swizzle-style drink. While we’re on the subject of white rums, I know many people will pick up a bottle of Bacardi Superior (Bacardi silver or white) because it’s one of the best-known (read: most advertised) rums on the market. Personally, I don’t like Bacardi — too much alcoholic burn, not enough rum funkiness or depth, and a dis-likable aftertaste, but their aged rums aren’t bad. I’ve never tried Cuban rum, and Puerto Rican Bacardi’s are said to come close, but I find it hard to believe that the company’s modern rums match those made in its Cuban days. Instead, I follow Jeff “Beachbum” Berry’s advice: Nicaraguan rums — such as Flor de Caña — make excellent substitutes for Cuban and Puerto Rican ones, as do Virgin Islands rums — namely Cruzan — which have more of a buttery mouthfeel and a floral flavor profile. Shake with a large amount of crushed ice and pour, unstrained, into a tall glass or Tiki mug, preferably a Painkiller mug. Dust with freshly-grated nutmeg and garnish with an orange wheel, cherry, pineapple chunk, or what-have-you. Yes, it’s remarkably similar to a Piña Colada, but so much better. 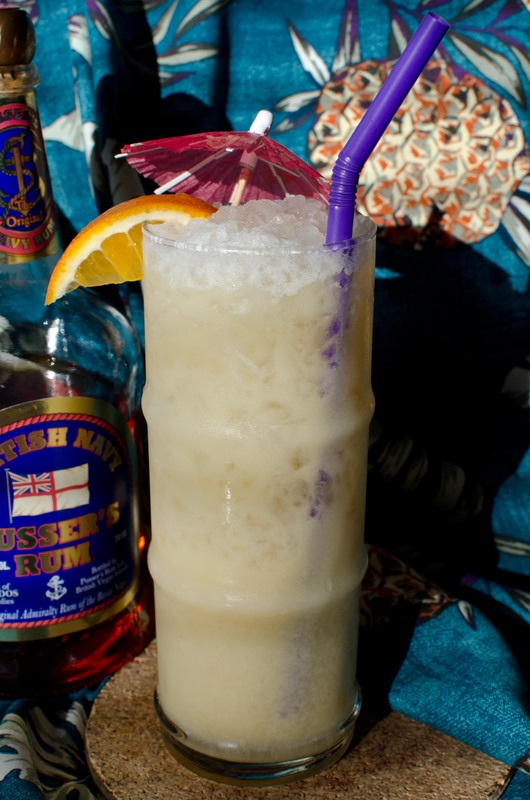 For one thing, the Pusser’s rum is a unique one, providing a wonderful bit of, well, ruminess (a funkiness that David Wondrich calls “hogo”) that you just don’t get with a light rum…oak and caramel, I’d say, but not heavy. Secondly, there’s much more juice in the Painkiller: it hasn’t got any heavy cream like modern incarnations of the Colada, and the orange provides a much-needed bit of citrus that cuts through the sweetness of the pineapple and Coco Lopez while providing complexity. Finally, that nutmeg on the top takes this drink into the Tiki category, adding a wonderful bit of spice for your nose (yes, I forgot to add it for the above photo…shame on me!). Feel free to increase the rum up to 4 ounces if you want to make this your one drink for the evening, or if you feel that the rum is a bit overwhelmed by the fruit and coconut (I like 2.5 — 3 in mine). Of course, no write-up on the Painkiller would be complete without mentioning that it’s a trademarked drink. The whole issue is rather silly, however, given that the drink was invented before the rum was even created (for the original, use a blend of Barbados and Jamiacan rums, or try Paul Clarke’s “Not-Exactly-A-Painkiller”). Pusser’s is a great, but very distinctive, rum, but you may not feel like springing for a bottle — in that case try mixing a few different rums, if you have that luxury, or another nice, aged rum like Scarlet Ibis, maybe even Zafra 21-Year. Smith & Cross is one of the few rums I’ve tasted that shares the hogo or funkiness of Pusser’s, in fact it has a much stronger flavor, so I’d recommended combing it with another gold or dark rum in the Painkiller. Banks 5-Island would provide some hogo as well, and might work well when combined with an aged Flor de Caña. Anyway, while the neighborhood boozers and I are busy mixing, go out and revive summer for an evening! Cheers! So what foods go well with rum. I’ve found that it pairs well with anything involving citrus and spice, or anything that comes from countries that produce rum and sugarcane! Ceviche, mojo-marinated chicken, jerk chicken, black beans & rice, grilled seafood — think Cuba and the Caribbean (or Spanish…Iberian Pig?) Fresh fruit would pair well with lighter rums. Asian dishes also work very well — spicy Thai food, for instance, or shrimp or chicken satay. Ginger and lime are staples that have always been used in rum drinks. Also, Tiki drinks partially survived because they were served in Chinese restaurants. I could see sushi working with lighter rum, but I haven’t tried that out. Rums can also work well with dessert — probably chocolate and fruit, paired with a dry, aged rum like Flor de Caña or Mount Gay. I imagine that’s why the Colonials dumped rum in their figgy puddings. I’ve seen a few references to pairing it with barbecue. Cuban-style, dry rums should work well with lighter fare — seafood, fruits, and salad — while richer, British-style rums (i.e. Jamaicans) would likely pair well with spicier foods. The more flavor or heat a food has, the heavier, older, and sweeter the rum you’ll need. Of course, I’ve been thinking about the rum being taken neat. Most rum drinks will work best, I think, with the spicier stuff mentioned above, since the drinks will inevitably contain sugar and fruit juices that’ll help tame the heat and spice. Two other styles — French and Demerara — might be trickier. The French (Martinique rhum agricole) is grassy and vegetal, and fairly dry, so maybe seafood. The Demerara is big, bold, and has lots of molasses, but semi-dry, so maybe desserts. Greek or Italian food? Probably not so much…but Indian food has some potential. Europeans drank lots of rum in India and Southeast Asia. This entry was posted on November 10, 2011 by IJ Lauer in Lime Juice, Orange Juice, Rum, Tiki and tagged classic daiquiri, drinks, lime, mint, mojito, orange, painkiller, pineapple, pusser's, recipes, rum.